Make your job search easier. Get personalized job alerts! Connet your LinkedIn profile to get fast & easy access to your dream job. 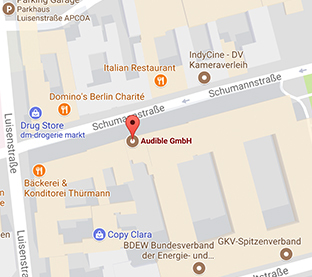 Our Berlin office is in the heart of the Mitte District, just five minutes away from Friedrichstraße, the German Bundestag and the Brandenburg Gate. Berlin is a city that doesn’t conform. The people, the lifestyle, the nightlife are all unique. It’s the perfect place to feel inspired. And our regular barbecues, foosball tournaments and rooftop gatherings ensure that our team is always collaborating in search of the next big innovation. Schumannstraße 6, 10117 Berlin, Germany. Sign up to be the first to hear when exciting new opportunities open up at Audible.